Coffee-black in colour. Aroma of molasses, nuts and caramel. A complex blend of dark malts, molasses & dried fruits (dates & prunes) create a rich, malty sweetness dominated by licorice and caramel notes. 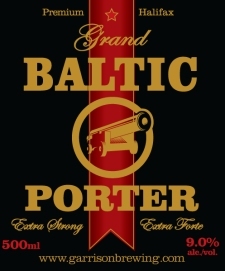 Garrison Grand Baltic Porter is 9.0% abv, and is available now in 500 ml bottles at the brewery.